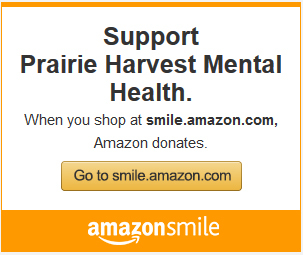 Prairie Harvest | We promote independence and an enhanced quality of life for adults with serious mental illness. Prairie Harvest Mental Health envisions people with serious mental illness living free from stigma and fully integrated into our community. Service: Serving people with serious mental illness is our highest value. Dignity: We treat everyone we serve and each other with courtesy, compassion and respect. Recovery: We focus on individuals maximizing their fullest potential. Competence: We strive for excellence and effectiveness in all that we do. Education: We educate ourselves and the community which decreases stigma and enhances community awareness. Health: We believe there is no health without mental health. Parity: We believe that health insurance plans should cover mental health at levels that are equal to any other medical benefits. 2019 Giving Hearts Day is February 14!